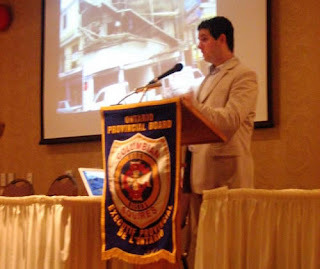 On June 7, 2008 Daniel Francavilla was invited to present to the Columbian Squires Ontario Provincial Board and guests at the 54th Annual Squires Convention in St. Catherines, Ontario. The Squires also presented ACCESS with a donation and a letter. Thank you to Dylan Robertson, Provincial Chief Squire, for coordinating the presentation. Arthur Peters, Executive Director of ShareLife, was also present. The Columbian Squires, which builds character and develops leadership, is the official youth organization of the Knights of Columbus.